Fall nail ideas include a range of colors and designs inspired by the beauty of autumn. The red nail is always a classic, but rich red hues are especially beautiful in fall, when they mimic the delightful colors of the apple harvest. Gradient orange with cream colors coupled with a delicate nail art make a perfect transition from summer to early fall. 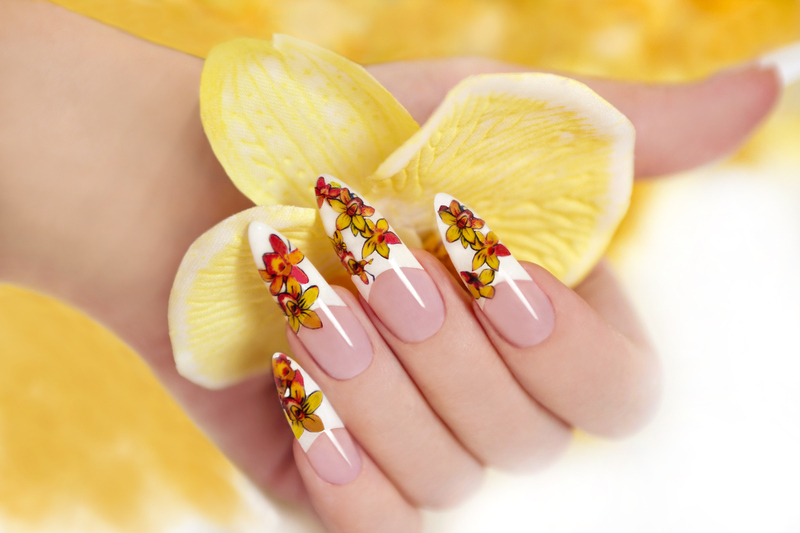 A go-to nail fall nail art idea that is at once classic and creative is an autumn leaf nail design. Black nail art with warm, burnished gold is perfect for any special occasion in fall. Striped nail designs are clean and sharp looking, and are a great go-to look for any season. Opt for a palette of gold, brown, or neutral hues. Contrasting black or white stripes make the pattern stand out and still make the look seasonal. Liven up a rich, earthy autumn hue with a touch of glitter. Brown shades, red-browns, and maroons are all perfect for fall. A grey-silver background and orange floral nail art evokes a sense of the season while still remaining delicate and feminine. Let the beautiful, crisp evenings of fall inspire your nail art with a deep blue polish color and star decals. Have some fun with your toenail designs before it's time to cover them up for the winter months. Fall means back to school, the return of routines, and saying goodbye to the lazy days of summer. Keep your nails looking beautiful by choosing a simple nail design, like a French manicure, that is easy to touch up. Fall is also prom season, and the perfect opportunity for some creative nail art. If your gown is simple, dress up your nails in a bold tri-colored nail design like this white and black floral look on a red background. Against a backdrop of richly-colored leaves, white bridal nails look beautiful. Consider accenting one nail (such as the ring finger) with a special autumn design for added creativity. Add a hint of Halloween to your fall nails with an orange and black nail art design. A circular graphic like the one shown is fresh and modern, making it work well for more than just Halloween night. Get inspiration for fall nail ideas from nature. Whether you create intricate autumn-themed nail looks or rely on a simple stand-by, there is an incredible array of colors and designs for this beautiful season.